Arts and Cultural Alliance of Sarasota County » Science and…the Circus! The Circus Arts Conservatory’s Education Outreach program recently invited two area middle schools to discover science through circus with an interactive curriculum called Alexander Calder & Newton’s Three Laws of Motion. Laurel Nokomis School and Sarasota School of Arts and Sciences visited the Sailor Circus Arena, where they learned and tried different circus acts like juggling, lyra and low wire. Later, teaching artists Karen Bell and Robin Eurich worked with the students in the classroom to create exceptional engineering circus marvels. All students had the opportunity to see, create and explore more with this circus-fueled scientific program! Alexander Calder was raised by artists and spent his childhood creating art pieces out of scraps of wire, cork, and fabric. As an adult, he received a degree in engineering and later returned to art, where his engineering background began to influence his work. An early foray into the art world was sketching for Ringling Bros. Circus. He became fascinated with the subject and created a kinetic, miniature circus that he performed in both Paris and New York City, and is now displayed at the Whitney Museum in the Big Apple. Sir Isaac Newton formulated three laws of motion in the 1600’s. These laws describe how motion operates and the relationship between gravity, friction, mass and acceleration on an object. His laws of motion will never change and are the gateway to astronomy and engineering. Throughout this project, students are exposed to hands-on inquiry based learning that asks them to problem solve with team mates to produce a required result. Like Calder, they are asked to use reused materials including wire, cork, bottle caps and other found materials. The students demonstrate their knowledge by engineering their own circus act and then describing the concepts to a younger student in a museum-like setting. The participants also work collaboratively, mirroring what they will have to do in the workplace and throughout life. 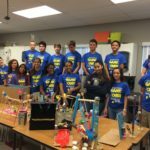 In addition, the students experience failure and success by trial and error and are challenged to solve problems as they arise. This arts integrated curriculum provides greater information retention for the students in all areas of learning. Many thanks to EdExploreSRQ and The Community Foundation of Sarasota for making this opportunity possible for these students.